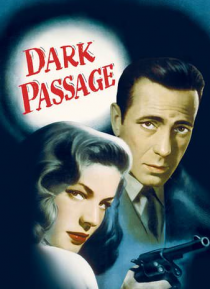 Bogey's on the lam and Bacall's at his side in DARK PASSAGE, Delmer Daves' stylish film-noir thriller that's the third of four films Humphrey Bogart and Lauren Bacall made together. Bogart is Vincent Parry, a prison escapee framed for murder who emerges from plastic surgery with a new face. Bacall is Irene Jansen, Vincent's lone ally. In a supporting role, Agnes Moorehead portrays Madge, a venomou… s harpy who finds pleasure in the unhappiness of others. The chemistry of the leads is undeniable, and they augment it here with exceptional tenderness. Exceptional, too, are the atmospheric San Francisco locations and the imaginative camera work that shows Vincent's point of view - but not his face - until the bandages are removed. Lest Irene get ideas, the post-surgery Vincent tells her: "Don't change yours. I like it just as it is." So do we.